I sat down recently to write a blog post about what government could do today if “political realities” allowed politicians to acknowledge the “real” realities of life in the age of scarcity. I quickly realized that before I could really address what might be done, it would be necessary to lay out clearly what those realities are -- that we are not recovering from a recession, but rather just at the start of what may come to be known as “the Great Contraction”. Early in the history of this blog I wrote a post on economic contraction(http://theeasiestpersontofool.blogspot.ca/2012/03/economic-contraction.html). That was two years ago and as events have progressed, it has become more obvious what the situation is and what lies ahead. I have to give full credit to Charles Hall, Tim Morgan, Gail Tverberg, Nate Hagens, Joseph Tainter and John Michael Greer among others for expressing this in terms that are pretty easy to understand. For many years I found economics quite confusing -- there seemed to be something missing from the economic theories I was reading. For the average person, the economy is about money. You work to get it, spend it to live, save some for the future if you are lucky. But if you ever try to figure out where it really comes from and how its value is determined, you’ll probably end up with a headache and no satisfying answers. This is because, despite what many economists believe, the economy is not really about money – money is just a set of tokens used to keep track of what is going on at a deeper level. The economy is actually about people working to produce goods and services needed and/or wanted by other people. “Working” is the key word here. To accomplish work, energy must be consumed, be it food powering muscles or fuel powering engines. So energy is the essential resource that enables all production. And it’s not just the amount of energy that is available to us, but also the difference between what it costs us to acquire the energy and the value of what we can produce with it – the “surplus energy”. This is expressed in the ratio “Energy Returned on Energy Invested” or EROEI. Every energy source that is available to us has a certain characteristic EROEI. It’s pretty obvious that if it takes more energy to make a fuel than you get from burning it (if its EROEI is less than one) then you’d be wasting your time to use it. But what isn’t so obvious is that an energy source must have an EROEI considerably higher than one in order to drive the kind of economy we’ve had for the last couple of hundred years. It seems that if the average EROEI of the energy sources we’re using falls below about 15, the economy fails to generate enough surplus wealth to allow us to make capital investments, or even repair existing infrastructure. Many people assume that technology can solve this problem for us. I don’t agree and I’ll be devoting my next blog post to why I don’t, but before going there it is important to look at the actual consequences falling EROEI has had over that last few decades. Currently, most countries find their overall EROEI somewhere in the middle of the range between 5 and 15, and this is the source of the economic troubles we are having. This is a fundamental problem that doesn’t really have a “solution.” No amount of government borrowing to “jump start” economic growth, no amount of fine tuning taxation or the monetary system, or fiddling with banking or financial regulations is going to make any real difference. If we can’t find energy sources with a higher EROEI (and it appears that we can’t), then we’ll have to find a way to live with the consequences lower EROEI’s -- we’ll have to adapt to economic contraction. I scanned this graph from Tim Morgan’s book, Life After Growth. The red line at EROEI=15 is mine. The horizontal axis represents EROEI, and that quantity decreases are we move from left to right. The vertical axis represents the percentage “profit” of gross energy extracted. 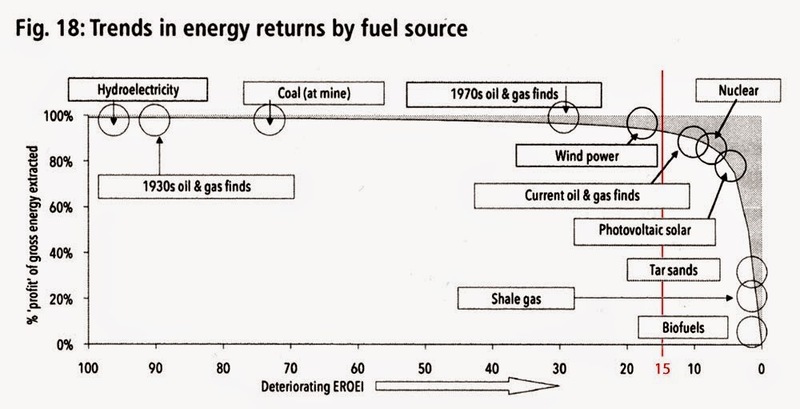 The main thing to note is the way the profit drops off to the right of EROEI=15, and that most of the energy forms that people are proposing as replacements for conventional fossil fuels have EROEI’s of less than 15, the minimum required to keep “business as usual” purring along as usual. It is also important to be aware of the relationship between surplus energy and techological complexity. When faced with a problem, we humans tend to find a solution in the form of a more complex technology. It is common these days to confuse energy and technology, because so much of our access to energy sources is mediated by complex technology. But technology is always just a way of using energy that already exists, and complex technologies always consume more energy than the simpler ones they replace. Of course the point of moving to more complex technology is that it gives us access to more energy than we currently have. Up to a point there is a net gain in tbe amount of surplus energy technology makes available, but beyond that point more complexity actually gives us less surplus energy. 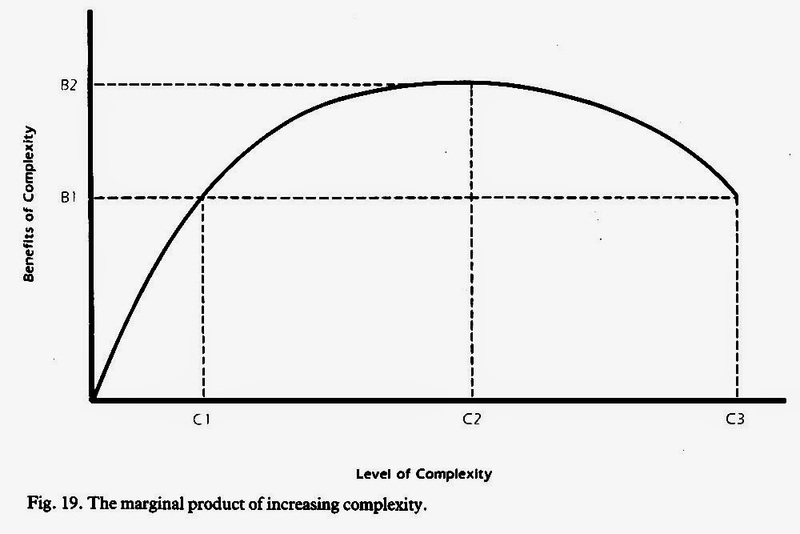 I scanned this graph from Joseph Tainter’s book “The Collapse of Complex Societies”. The horizontal axis is complexity, increasing as we move from left to right. The vertical axis is the benefit we get on our investment in complexity. Note that as we move to the right of the origin, benefit initially goes up quickly, then less and less quickly until at point C2 the benefit reaches a maximum and further increases in complexity actually yield less benefit, until at point C3, benefits have decreased back to the same level as at C1, a much lower level of complexity. Looking at history there are many cases of a society reaching point C3 and then falling fairly quickly back to point C1 or below, drastically reducing complexity with little loss in benefits. This is what Tainter means by collapse. For most of human history, stored solar energy in the form of food and firewood were the only available sources of energy. And muscles (human or animal) were the only way of converting fuel (food, in this case) into useful mechanical energy. Hunter gatherers, using the simplest technology, worked with an EROEI of around 10. Advanced agricultural societies, before the industrial revolution, had an EROEI of around 6. And today’s industrial agriculture, considered by itself, has an EROEI of around 0.1, using 10 units of fossil fuel for every unit of food energy produced. You may wonder why we went in this direction if the energy return for our efforts kept getting lower. While a hunter gatherer got a good return on his efforts, there was a limited amount of energy available to be had in his environment and the supply was for the most part beyond his control. Hunter gathers worked shorter hours than we do as long as times were good and when times weren’t good they either had to suffer where they were or move on to better hunting grounds. With agriculture came greater control of the environment -- being able to plant whole fields full of nothing but edible plants, herding animals rather than hunting them. And it was easy to work longer hours, indeed in the busy season on a farm there is always more work to do. So the net result was the ability to support more people in a smaller area, with enough surplus food to support a class of non-farmers. And since farmers were not mobile, it was easy for the “upper” class to tax that surplus and live off of it. Farming villages grew into cities and cities grew into empires. The surplus energy to fuel all this growth came from food and firewood, and once a city had maxed out it’s local farmland and forest, there was nothing for it but to expand farther into the surrounding territory. Due to the limitations of transportation technology, this had limits. It is interesting to note many of these civilizations eventually collapsed, indeed very few are left today. There are many reasons for this including contact with Western civilization in the last couple of hundred years. But one of the most common causes of collapse is failure to manage agricultural land and forests (their only sources of surplus energy) in a sustainable manner. One might ask that if this is even possible. It has been done, though, by several societies at the agricultural village level and by at least one at the nation state/empire level. But that is another story. At any rate, the collapse of an empire is not the end of the world -- merely a step down to a less complex level of technology and a lesser degree of governmental centralization. With the industrial revolution came some fundamental changes in the surplus energy equation. With the invention of the steam engine, heat could be converted into mechanical energy. Hardly enough can be said about what a game changing thing this was. Yes, late in the age of agricultural civilization, falling water and wind were harnessed to do work, but this was a relatively minor thing compared heat engines fueled by coal. Coal could be had for free -- you just had to dig it out of the ground and the energy needed to do that was a tiny fraction of the energy to be had from the coal itself. And the difference between the cost of coal and the value of the work it can do when burned in a steam engine made a huge difference to industries that had previously used human or animal muscles for mechanical power. As an example, the cost of coal is currently around $64 per metric tonne. Burned in an engine that is 25% efficient, that tonne of coal will produce an amount of mechanical energy equivalent to around 25,000 manhours of strenuous human labour. Where I live, the minimum wage is $10.50 (Canadian dollars) per hour, so considered on this basis, the mechanical energy produced by burning $64 dollars worth of coal is worth $262,500 if it had to be replaced by human muscle power. Similar calculations can be done for oil and natural gas. Of course that sort of calculation is a gross simplification that ignores many important factors, but it gives you some idea of the difference between the price and the value of fossil fuel energy. That difference was the engine behind economic growth during the industrial revolution and in the years since then. So, the economies of nations that could take advantage of fossil fuels and heat engines started to grow much faster, and kept growing for the last 200 years. This is where money and banking came to play a larger part in the story. It is important to keep firmly in mind that money is just a marker for real wealth, which exists in two forms: real, useful goods and claims on future productivity -- the ability to make more useful goods down the road. Since productivity is based on surplus energy, the wealth available in a society is approximately equivalent to the amount of surplus energy available. As long as productivity was based largely on what could be done with human muscles, growth was slow. Money based on precious metals worked because we could dig them out of the ground approximately as fast as the money supply needed to expand to accommodate economic growth. Economic growth really began to speed up in the 20th century and the money supply became a problem. After WWII, most countries switched over from the “gold standard” to fiat currency, which is basically money created by banks out of thin air when they lend it to you. A lot of people think this is crazy, but with a rapidly growing economy it is just about the only way for the supply of money to keep up. So, in our current financial system, money is debt. Because debts are required to be repaid with interest, the economy must grow so that there will be more money to pay back the interest. Where does that money come from? More loans, of course. This means that if growth stops or even slows down, there will be many loans which can’t be paid back. At the moment we have no idea of how to wrap this process up and switch to a zero or negative growth economy. Though very few people can imagine why we would want to do that, we have in fact no choice but to do so. It would be worth a quite a bit of effort to find a way to do it that doesn’t end in disaster. The thing is, all this economic growth is driven by surplus energy from fossil fuels, but the supply of readily accessible fossil fuels is not infinite, nor is there any workable replacement in sight. Yes, there are huge fossil fuel resources buried in the Earth’s crust, but it is a serious error to divide the resource quantities by our current rate of use and conclude that we have decades or even centuries of supply left. The EROEI of most of these resource is so low that they will not sustain a modern industrial economy, nor can they be accessed at a high enough rate to meet current demand. I am pretty sure that 200 years ago, when we set out on this course, it should have been obvious that someday the party would have to end. But as long as the end was a long way in the future, it was easy to leave it for a future generation worry about it. When I first found out about Peak Oil fifteen years ago, I had a picture in my mind of big underground caverns full of oil, in places like Alberta, Texas and the Middle East. By drilling enough wells, you could keep up with growing demand--until getting to the bottom of the tank. Then supply would drop off very fast and the price would go through the roof, causing the economy to crash permanently. Actually, that’s not what the petroleum geologists who were talking about Peak Oil meant at all. Oil is found in porous rock formations, in deposits of various size and quality, at various depths, and unequally distributed around the planet. This has some consequences, many of which have played out over the last 40 years or so. What follows, by the way, are observations of what has been happening, not predictions. When I switch over to making predictions, I’ll let you know. When using resources like fossil fuels, we tend to pick the low hanging fruit first. That is, the least expensive, most easily accessed resources are always used up first. The alternative would be to ignore them in favour of ones that are harder to come by. Which, when you think about it, would be pretty dumb. But going this way does have some consequences, in that by the time you have set up a system that is really dependent on the resource, the low hanging fruit is gone and what is left is more expensive and so the system faces some challenges. What I think was not well understood initially (and is still not understood by all but a small minority) was the key role energy plays in the economy and the feedback mechanism that exists between the price of energy and economic growth. All but one of the recessions since 1950 were preceded by a spike in oil prices, in other words, a reduction in the availability of surplus energy. Well before we reach the peak of oil production, the EROEI starts to decrease, the price goes up and this slows down the economy. Demand for oil is reduced and the price comes back down. At this point the economy may start to grow again, as it did many times since the 1970s, or it may not, as has been the case since 2008. Of course, since oil is not evenly distributed throughout the world, some countries have more, some less. And some use more oil than others. The significance of this can be seen by looking back over the last few decades. What I am calling the Great Contraction really started in the 1970s when oil production peaked in the continental US. The US was well endowed with oil resources, but it also was (and still is) a major user of oil. From the end of WWII to 1973, oil flowed freely and drove the American economy in an unprecedented burst of growth which seemed to be bring all things good to the American people. So it is not surprising that oil production peaked in the continental USA before much of the rest of the world, in the 1970s. But, hey, no problem, there was still lots of oil available on the world market, the price was low, and the USA was a very productive industrial country, so it could afford to import oil, right? Yes, except for OPEC, the Organization of Petroleum Exporting Countries, who saw the opportunity created by the situation, and spurred into action by the American and European support for Israel in the Yom Kippur War, declared an embargo which forced the price of oil from $3 per barrel up to $12 per barrel. This was a profound shock and sent most of the world reeling into a recession. Then the Iran-Iraq war in 1979 reduced the production of oil in both those countries and caused another oil shock. Jimmy Carter was about to set the US on a course towards what we now call sustainability, but Reagan won the election in 1980, and with a last gush of oil from Alaska, kept the party going for a few more years. Something similar happened in Britain with Thatcher and the North Sea oil. But it should have been clear that this was a temporary reprieve. Governments have done their best to diddle with the economic indicators, but a close look beneath that facade shows that real growth stopped in the 1990s. Since then we’ve got by on ever increasing debt, globalization, and the gradual elimination of the middle class, financing a few more years of partying for the rich. But all these stop gap measures were in fact huge mistakes, which have only made things worse, not better, for all but a very few people. Countries like the “PIGS” in Europe with little or no fossil fuel resources have suffered greatly, as the rising cost of imported energy has forced them towards bankruptcy. The oil exporting countries have found themselves temporarily rolling in cash and have even had trouble finding places to invest their money. Some of it has gone to subsidizing the cost of food and fuel for their own citizens. This is a bit of trap, for as their oil reserves decline and they have to start importing energy to keep up with domestic demand, they switch over very quickly from being rich to being poor, leaving their people very unhappy. Egypt over the last few years has been a clear example of this. As the economy has slowed down, interest rates have been lowered in an attempt to keep things moving, and returns on investments in general have decreased. Those with money to invest have been left with a real problem of where to invest that money at a “reasonable rate”. They have been forced to accept higher risks, often buying into bubbles, and losing it all when the bubbles burst. Since the crash of 2008 markets have recovered nicely, even though the real economy has not. Much of this has been the result of governments printing money, which is just another sort of bubble. At the moment much so called wealth consists of promises that probably can’t be kept (debts that will never be repaid). As more and more conventional oil fields go into decline, we are turning to fossil fuels with ever lower EROEI’s. Tight oil and gas, which have to be “fracked” from the shale formation where they are found are the current poster child for this. And in the last decade they have made a big difference, offsetting much of the decline in conventional oil. Fracking has been heralded as the solution to America’s energy problem for the next century, but in fact the decline rate on fracked wells in very high and the “sweet spots” in the shale formations have already be tapped. It also seems that original estimate of the amount of oil and gas available in these formations may have been rather optimistic. The estimates for the Monterey shale in California were downgraded by 94% this spring. Here in Canada, Alberta’s tar sands are said to hold great promise, but the EROEI is in the range of 2 to 3, So this is little more than a way of turning high quality natural gas into low quality syncrude, and doing a lot of environmental damage in the process. And lowering Canada’s overall EROEI while they are at it. We have been told for years that there are hundred of years worth of coal left in the ground, but when you look at the coal supply situation, it seems not nearly so good, with most of the high quality coal gone and most of what’s left being the lower quality types, with a much lower energy content. OK, that’s how things stand currently. Those predictions I was talking about start here. And some opinions as well. Continual growth in on a finite planet is clearly impossible. But it seems that long before we ever get to outright physical limits on growth, the surplus energy available from fossil fuels--the resource that have been driving growth--will run out. Our economy shrinks or grows according to the amount of surplus energy available. For the last 200 years, there was abundant surplus energy and the economy grew. Now that abundance is dwindling and the economy will inevitably shrink until it matches the level of surplus energy that will be available without fossil fuels, basically from sunlight and its derivatives. We are entering a period of decline. There is no question of this. The question is how fast, how far and how much human suffering will be involved. The fracking bubble will burst sometime in the next few years, causing financial havoc and in all likelihood a stock market crash. And when all those tight oil and gas wells go into terminal decline, there will be a real shortage of energy. Energy prices may temporarily shoot up, but demand destruction will slow the economy down and oil prices will settle out not much above where they are now, but at a lower level of energy use and a lower level of economic activity. This contracted economy will not be able to support continued efforts to access low EROEI energy sources like the tar sands. We will turn to coal for more of our energy needs and very quickly use up the remaining reserves of coal. All this will mean fewer jobs and more people looking for government support. At the same time, governments are going to become less and less effective at providing that support, simply because their tax revenues are going to drop over the years ahead. First, as the economy continues to contract, the tax base contracts along with it. But beyond that, wealthy individuals and large corporations have the political clout to ensure tax cuts for themselves--they have the power to simply refuse to be taxed. And as the rest of us become poorer, we will have less income and less property to tax. The result of this will be tax starved governments, who will be even less capable of supporting the growing numbers of citizens in need. As fossil fuel reserves become more and more constrained this will happen again and again. Demand destruction will continue until our standard of living has decreased to the point where it can be supported by renewable energy resources, where our energy income from the sun matches our energy use. In the 1970’s there was sufficient oil, coal and natural gas left to fuel this switchover and “powerdown” the world economy in a controlled fashion, taking advantage of the full range of renewables. To initially set up the infrastructure for many of these renewables, a high level of surplus energy and a global network of suppliers maintaining a high level of technology is required. If we wait until economic contraction is well underway, the global network is starting to fall apart, and remaining fossil energy resources are further constrained, we may not be able to take advantage of all the available renewables, falling to a much lower level of technological energy use. Perhaps as far as firewood and muscle power, supplemented, if we are lucky, by wind and water power where that is most easily available. It seems likely that we will end up getting along with between 10% and 20% as much energy as we in the west are now using. Toward the upper end of that range if the decline is well managed, perhaps even below the lower end is it is not. Of course for many people in the developing world, this won’t be much of a change. This decline will be relatively slow, taking many years. It will progress at various rates over time and hit some areas harder than others. Gradually, the highly networked global economy will breakdown and we will be forced to fall back to local resources. Occasionally that breakdown will come in larger, more catastrophic jumps. Occasionally there will be wars over resources, and revolutions when people blame their governments for the continued decline. Now I think it is clear that a government which was aware of this decline (and its inevitability)-- even a tax starved government--could take steps to mitigate its negative effects. Very different steps from the attempts to use debt to jump start the economy that we are currently seeing. And very different from governments who choose to fight wars over resources that have almost run out anyway. I’ll be talking about that in a post coming soon. As an aid to those who want to read this whole series of "Political Fantasy" posts, here is a complete set of links. say... even if I had some knowledge.....I enjoy the way in which you write as well.. your explanations and your style....in places it reminded me of Zen and the Art of Motorcycle Maintenance (I mean that as a big compliment). Thanks, Brian. It's always nice to hear some encouragement. I have three or four more posts in the works and no doubt ideas for more will come as time passes. But I like to research them carefully, so it takes a while. Some blog writers put up a new post every week, which must take an incredible amount of work. Impresses me, anyway. Yes, agree with Brian...this is very well written and easy to understand. When I first found your blog I went through all the previous posts and read this then, but it's worth many reads. Just a small comment: in the 2nd para under Tainter's graph you talked about the EROEI of industrial agriculture and I did double take when you calculated the EROEI (1 cal food energy for 10 cal fossil fuel energy) as 1. But I peered closer and saw the decimal point. So maybe for those of us with poor eyesight it might be better to put in the initial zero, i.e. 0.1. Otherwise first rate. I'll put in a link on my blog. foodnstuff, thanks for your suggestion, which I have implemented. Much clearer that way.